All images by Jonathan Kalan. What’s the secret to attracting 300 patients a month to a brand new, three-room health clinic in a sprawling industrial area? It might be the free manicure/pedicure women receiver after paying for a full “head-to-toe” checkup, but more likely, it’s the value of Penda. 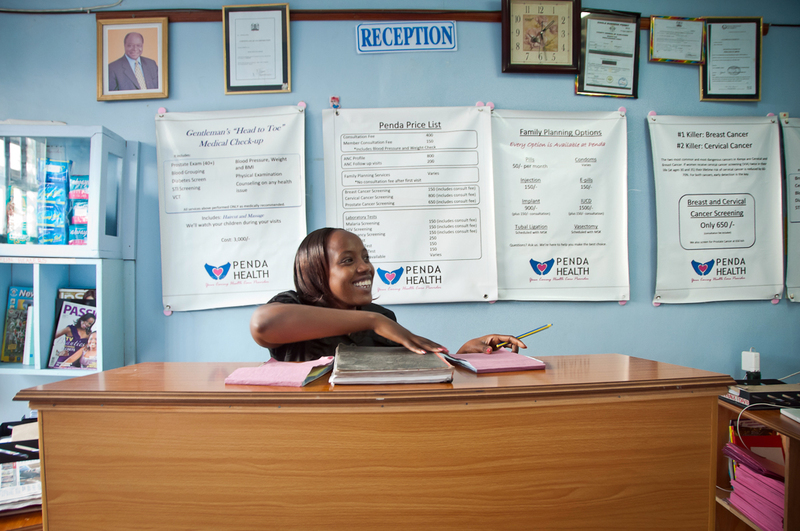 In Swahili, Penda means love, and that’s the key to Penda Health Clinics, a new chain of low-cost health facilities in Kenya that puts “care” at the center of their business model. In January of this year, the first Penda Health Clinic opened in Kitangela, a rapidly growing city just an hour outside Kenya’s capital of Nairobi. Penda’s mission is to revitalize health care service delivery by providing high-quality and affordable healthcare to Kenyan women and their families. Their services range from reproductive health, maternal health and family planning for women to full checkups for men and children. Being “nice” may not seem like a revolutionary innovation in health care, but in Kenya, going the extra step and putting the patients first may make all the difference. It helps build relationships, and a trust between doctors and patients that results in return customers, making both preventative care and diagnosis easier. After just five months of operation, 25 percent of Penda’s visitors are now returning visitors – either themselves, or with their families. If patients do have to wait a few minutes, the receptionist will sit down with them, apologize for the delay, and offer a free information and awareness session on the spot. Though Penda may be slightly more expensive than a public government hospital, it is cheaper than or equivalent to most private clinics, and draw from a wealth of experience. There is one clinical officer (similar to a physician assistant) and one certified nurse on staff at all times. 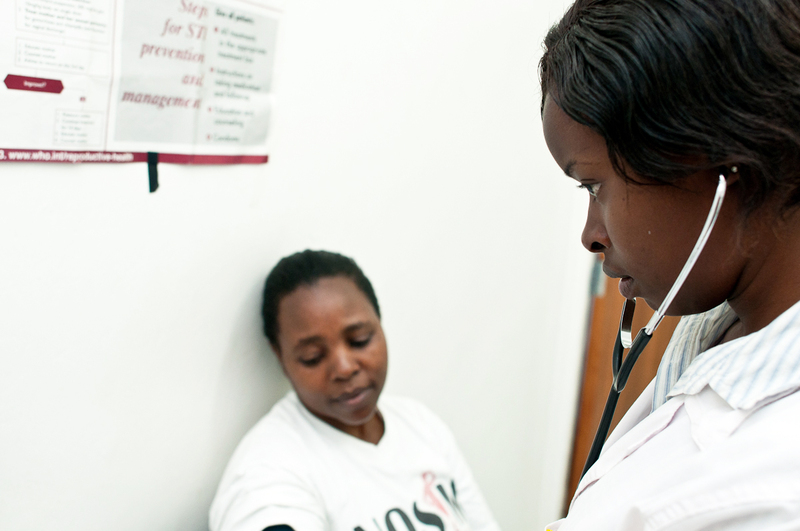 A medical advisory board split between the U.S. and Kenya is always on call for advising. The clinic is fully stocked with supplies, medicines, tests, and essential equipment that is often lacking in other small or government clinics. For example, at a nearby hospital in Kitangela, to get a malaria test, patients must visit to the hospital, request a test, consult with a doctor, then go across the street and purchase their own test kit (sometimes even the medical gloves), and return to the hospital for test and diagnosis. This type of self-service care is common. Most of the women come to the clinic for immediate treatment, yet Penda’s staff is focused on education and awareness for preventative care. “Have you had a pap smear lately?” or “Would you like any advice for family planning?” are common questions after the initial reason for visiting is addressed. While their approach to care is key, it is not the only innovative thing about the Penda model. First, they have found a unique way to serve a growing market: women working in factories. Nairobi alone hosts roughly 50 factories with 1,000 or more female employees working in one location. These women work and commute for long hours, limiting the time they have to access critical healthcare. Penda is open 12 hours a day on a walk-in basis, near many of these factories. To reach these women, Penda is connecting directly with the factory management, while also holding information sessions at churches, community meetings, women’s groups, and other places that help them engage potential clients. Second is their financing model. Penda Health is a for-profit company, and in one of the most unique funding models I’ve seen in the east African social enterprise space, Penda creatively devised a “Social Shares” program to help build their first clinic. Instead of seeking impact investors or angel investors to raise the $20,000 needed for one clinic, they crowdsourced investment from those who wanted to be a part of the clinics success. Individual investors, via PayPal, purchased “Social Shares” – essentially loans – of $100 each, in the individual clinic. If the clinic is successful, their investment will be returned plus a 5 percent interest rate in two years. If its not, “we can’t promise anything,” they state clearly. While the company has also recently received investment from U.S. impact and Kenyan investors for overhead costs, they feel that this model of crowdsourcing for establishing individual clinics is the best way to engage a broader base of supporters with less cash. It’s like a Kiva model, but for growing social enterprises. They believe the best investors are those who believe in the mission of the clinic, and they will enjoy literally tracking their investment as the clinic grows and serves more patients. It will be many more months until the first Penda Health Clinic is fully financially sustainable, but they seem to be well on their way. According to mangers, the clinic has already served over 1,300 patients, and has provided cervical cancer screening for 53 women, with fewer than ten cases being flagged and referred to a larger hospital – giving several women an essential early start in case they need treatment. The most important metric to Penda, however, is how their customers feel. While perhaps Sowden may be the only who gets away with actually hugging patients, (“you’re white, it works, otherwise it’s kind of awkward for us!” his Kenyan colleagues joke), the numbers are strong. “99% would recommend us to a friend. 96% give us 5 out of 5 starts for friendliness. We’re very proud of these comments” Penda reported on one of their most recent blog posts. 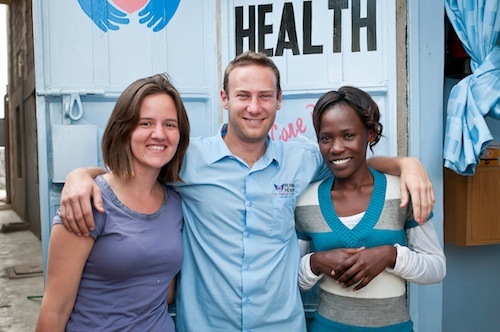 For Kenyan health care, it seems the “care” is one missing component that Penda hoping to fix. (Left to right) Stephanie Koczela, Nick Sowden, and Beatrice Ngoche, the founders.